Join the North Carolina Botanical Garden to help celebrate National Public Gardens Week at the Carolina Campus Community Garden (CCCG) on Tuesday, May 14, 2019 from 10-11:15 a.m. to plant a tomato, give a garden! With the generous support of the Employee Forum and Carolina Center for Public Service, we will be repotting individual tomato seedlings to contribute to food security for CCCG recipients. Visit the Plant a Tomato, Give a Garden event webpage for details and to RSVP by May 10, 2019! Space is limited. We will establish a waitlist once the event is full. We welcome interested UNC employees and units/departments from across campus to gather their workgroup to bond through service to their community. Please remember that all UNC staff have community service leave available to use for events like this; supervisor approval is required. For details, see the FAQ’s on the RSVP webpage. Tomato sandwiches and water will be provided for all volunteers to enjoy. 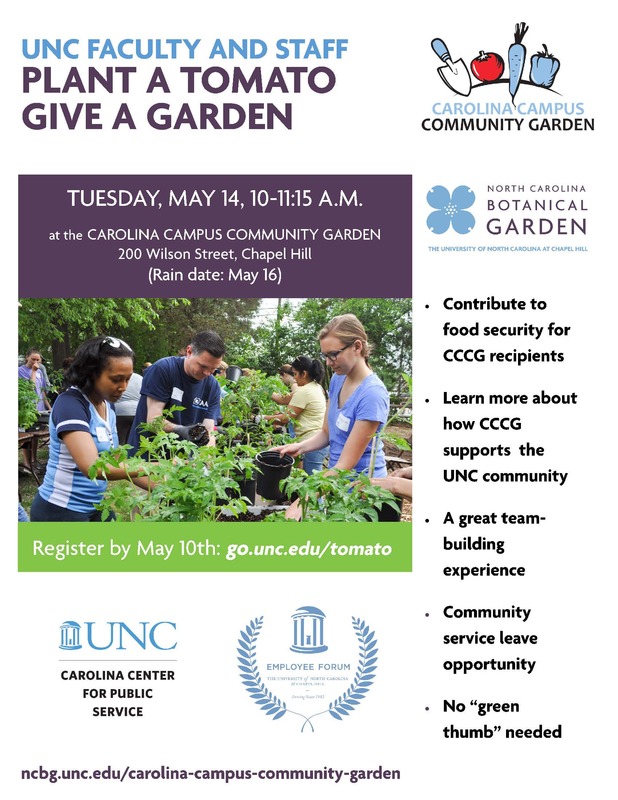 There will also be garden tours following the event for those who would like to learn more about the CCCG and how it serves the UNC community. The CCCG is located on the UNC campus at 200 Wilson Street (near the Carolina Inn). There will be limited parking set aside in the Nash Lot across from the CCCG for those needing to drive. Walking or biking to the event is the best option for most employees on campus, however. There are also numerous public transportation options available via Chapel Hill Transit. The rain date for the event is Thursday, May 16.